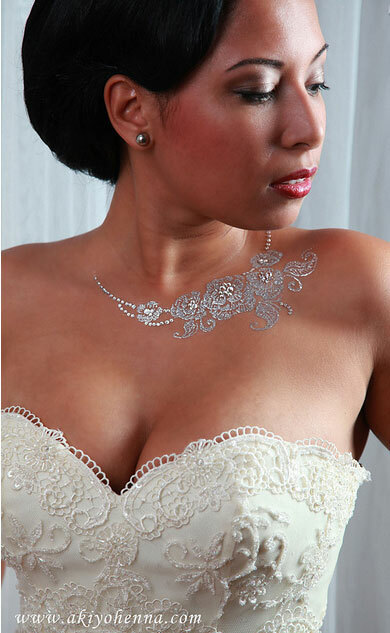 bride.ca | Beauty Trend: Swarovski Henna? 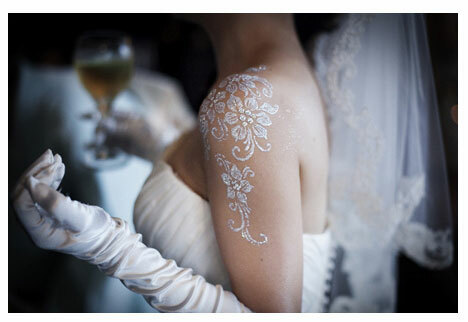 Old meets new again, when New York City studio Akiyo Henna takes the traditional art of henna design and creates a new modern twist by creating one-of-a-kind shimmer body art that can be left as is or can be adorned with Swarovski crystals to give brides a extra glow on their wedding day. Patterns range from the simple to the elaborate and can be placed anywhere on the bride's torso depending on how much skin the gown exposes. The most common body parts to have decorated include the arms, the back, the hands, or the shoulder and the collar. The artwork is waterproof and can last up to 10 days.